HOME / Abstracts / Urate Lowering Therapy (ULT) reduces non-specific foot pain in patients who fail to meet ACR/EULAR 2015 Gout Criteria; an effect predicted by Ultrasound and potential rationale for re-classification. Yousef Alammari, Diana Gheta, David Kane, Ronan H. Mullan ***(PLEASE NOTE) this is the correct version of this paper. A previous similar submission contained a transcription error and is to be replaced by this version). The ACR/EULAR Criteria for gout require a prior history of acute attack involving a peripheral joint/bursa(1). The presence of chronic non-specific foot pain, which is insufficient for a gout diagnosis, may occur with hyperuricaemia(2). This case-control study evaluated urate deposition in hyperuricaemic individuals who do not fulfill gout criteria, and a potential role for ULT. Hyperuricaemic individuals with chronic foot pain, not fulfilling diagnostic gout criteria (n=16) were compared with asymptomatic hyperuricaemic controls (n=15). US of bilateral MTP1 and features of monosodium urate (MSU) crystal deposition including Double Contour (DC) sign, Tophus, or erosion were recorded. Cases only were treated with febuxostat 80mg for 3 months. Serum urate, 24hr and 7-Day VAS pain scales and the Manchester Foot Pain and Disability Index (MFPDI) were recorded. DC sign, Erosion and Tophus occured in 44%, 37% and 37% of cases respectively (Fig1). No US features of gout occurred in controls. Serum urate was higher in cases (449+19 μmol/L) vs controls (421+7.1;p=006). For cases, baseline 24-hr VAS (65+4.9) reduced at 1-month (41+6.6;P<0.001) and 3-month (32+7.4;P=0.001) of ULT. 7-day pain VAS (70+6.8) decreased at 1-month (43+7.1 P=0.001) and 3-months (37+8.3);P=0.001). MFPDI (25+2.1) decreased at 1-month (21+2.9;P=0.012) and 3-months (17+3;P=007). When grouped according to the presence (n=7) or absence (n=9) of DC sign, no differences were observed for baseline pain scores (Figure2). 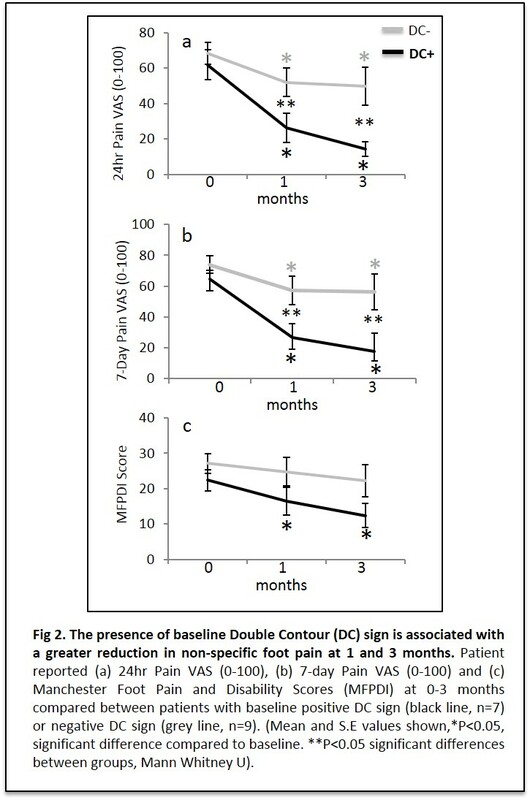 Following ULT therapy however, 24hr VAS pain scores were significantly lower in DC positive patients at 1-month (26+8.4 DC positive vs 52+8.1;P=0.05 DC negative) and 3-months (14.3+4.2 vs 49+10.1;P=0.017). 7-day VAS pain scores were significantly lower in DC positive patients at 1-month (27+7.6 vs 57+9;P=0.023) and 3-months (17.8+6.4 vs 56+11.6;P=0.026). 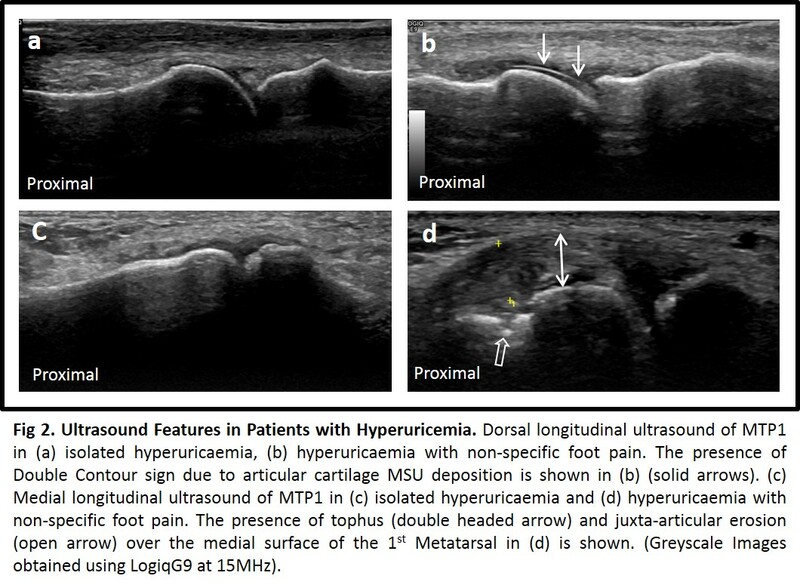 Ultrasound features of MSU crystal deposition are strongly associated with non-specific foot pain in hyperuricaemic patients, who do not otherwise fulfill the diagnostic criteria for gout. Treatment with ULT reduces non-specific foot pain to a greater extent in patients with US evidence of MSU crystal articular cartilage deposition. These findings suggest the ACR/EULAR 2015 criteria are insufficiently sensitive for early gout detection and should be changed to aid earlier treatment and long term control of this debilitating disease.